That there on the left is what the House of Commons looked like debating one of the most important Bills in the history of free speech and copyright protection. Looks a bit... empty, doesn't it? 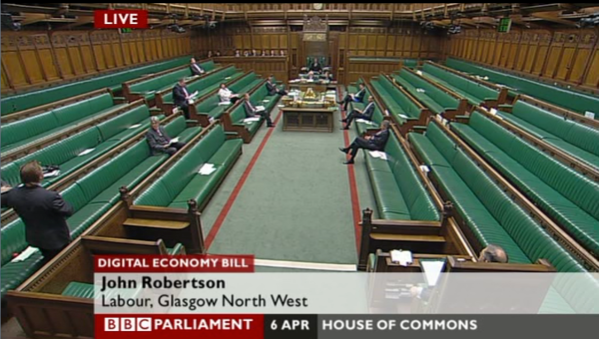 In fact, over 100 MPs waltzed in after the debate was over and cast their vote to pass the Digital Economy Bill, while a further 412 MPs - that's 64% of the total in the Commons, didn't even bother to show up and vote at all. The Conservatives were the worst offenders - just 9 of them (4.7% of their total) used their vote. And yet you can bet that if there is low turnout for the General Election on 6th May, these will be among the first people to criticise the British electorate for not engaging in democracy. 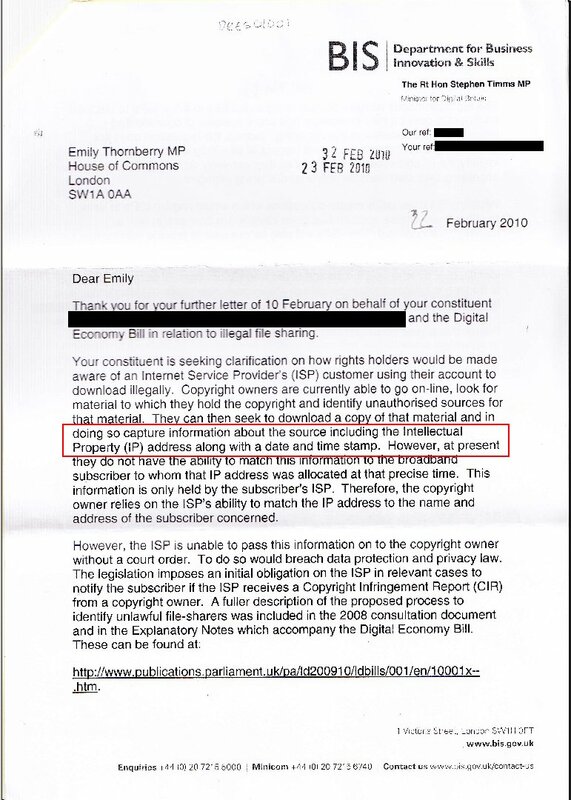 I find it frightening that so many MPs fail to understand the importance of new technology, and it says much that one of the ministers responsible for driving this Bill through Parliament thinks that the IP in "IP address" stands for "Intellectual Property". In fact the politicians have so little understanding of this issue, that they'll happily pass a new law clamping down on intellectual property theft with one hand, whilst stealing images from the BBC website to use in their childish poster campaigns with the other. That same link suggests that they even understand that copyright law is outdated, yet rather than concentrating on changing that first, they make another one to sit on top of it. This is in the same week that I received an email saying all three major parties have now made verbal commitments to libel reform - an admission that the current law is an attack on free speech and on the principle of "innocent until proven guilty". And yet, they pass a new law that places the onus on the defendant to prove they didn't download copyrighted material, rather than copyright owners having to prove that they did. And ladles on a punishment that penalises everyone who uses the same Internet connection, rather than just the guilty party. This is exactly the same sort of problem as we have with libel law. Is it too much to ask for consistency? And what are the implications for the politicians' promises to implement libel reform? I'm happy to say that my MP, Jeremy Corbyn (Islington North) was one of the 23 Labour MPs who voted against the Bill, and he's also a staunch supporter of libel reform. You can see whether (and how) your MP voted here, and you can find out the nearest MP who voted against the Bill using this handy map (thanks to @qwghlm). Why not send them a nice message to thank them? Most of these links came via my old school chum @comaboy (thanks Gareth). The other thing that's been bugging me about the upcoming elections is the sheer volume of leaflets we've been getting through the door. It's more than one a week. Now, this would be fine, if they were all from different parties, but they're not. The vast majority of them are from the Lib Dems. I tweeted about this yesterday, and started receiving replies from a party activist. She told me that I was wrong. She made a fair point that not everything can be done by Internet because this would likely exclude large demographics. But does anyone need more than one letter a week from a single political party? Yes, she argued, because people like the "personal touch", so there. They might like the personal touch if letters had been carefully and personally addressed to their concerns, but they're not. They're fed through a large spreadsheet of the local electoral register, and mail merged. This gives everyone their own name and address at the top of their identikit letters. That's not a personal touch. That's Microsoft Outlook. And what do the letters say at the top every bloody time? "DON'T VOTE FOR THE TORIES AS A PROTEST VOTE, THEY CAN'T WIN HERE! VOTE FOR US AS A PROTEST VOTE INSTEAD!" Oh, great. That really makes me want to engage in local politics. The thing is, the Lib Dems have controlled Islington council since 1999, and it looks like they do a pretty good job. Which is something I want my politicians to do. A good job. But I don't want them to constantly waste paper. And I don't want their campaigning to consist almost entirely of telling me how mean all the other parties are. They're not mean (apart from the BNP). They simply have different ideological starting points. I'd far rather they sat down around a big table and had a nice little chat. Perhaps they could put some biscuits on a plate and drink tea. Their campaigning makes me not want to vote Lib Dem. It's an approach that's completely alien to me, and makes me feel disenfranchised. And I have a bit of a soft spot for the Lib Dems. I've voted for them before, back in the days when you knew what their policies were. But I'm probably going to vote Green instead. At least in the local election. Jeremy Corbyn's pretty much bagged my vote for the General Election already. There are some interesting Internet quizzes already doing the rounds suggesting which party you should vote for - Vote for Policies requires a fair bit of reading, but is more detailed than most - and Vote Match is on the Telegraph website and seems to have a fairly hefty anti-EU bias in its questions' wording, but if you can get over that it's also quite interesting. Of course, you should be voting primarily on your who your local candidates are, not parties. And surprise surprise, the news was concentrating on "The Economy" again today, and the main parties were all going on about how they would magically "eliminate waste" or make "efficiency savings". Do we have to thank Ian Paisley for voting against the DE bill? You should praise 5 times for every time you criticise, Rory, as every teacher knows. Oh, and got another reply from the LibDem. She thanked me for my comments and said they'd been taken on board.